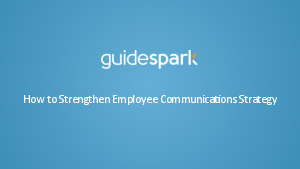 An effective employee communication strategy is key to engagement. The majority of HR leaders say they have a tough time communicating complex topics, engaging employees, and reaching extended families. 56% of employees wish their employers would communicate benefits in a way that is easy to understand, and 61% would like to spend as little time as possible to learn about them. We need to adapt our communications strategies. Learn how and find out the Top 10 Tips for an Effective Communication Strategy Playbook.